Our Heartiest Tashi Delek to the Royal Couple! More Galleries | Comments Off on Our Heartiest Tashi Delek to the Royal Couple! 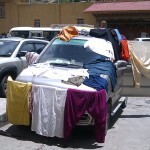 Comes with own car, driver, laundry and dryer… Spotted on Changlam 2010.